house of spoon: i just can't get enough!! haha moooooore magnets!!! I'm loving this craft... it is super simple!!! Can you read the little purple "loves" in the middle??? Again...this one is waaaay clearer in "real life"....aww.....i wish i could use a camera! 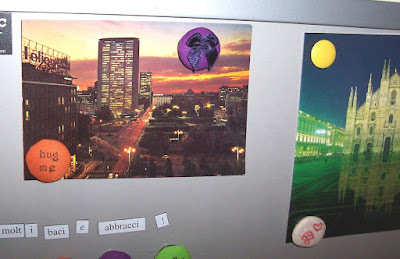 o i love the "purple bow - orange hug-me" combo on the milano-by-night postcard.....fun!!! So it seems! You must have millions by now! Did you ever hear the one about the man who had so much that he decided to eat, drink and be merry for many years, and didn't consider the widow, the orphan, the disadvantaged,the "Mum" who had none?